Here's another fun thing to acid test: sour cotton candy. Since the cotton candy sugar strands are so thin, they dissolve almost instantly, releasing the sour acid to react with the baking soda. The result? LOTS of bubbles. No, I didn't jump on a spaceship (too bad). But here's a video of a candy experiment in space, in which a NASA astronaut sticks candy corns in a floating ball of water to demonstrate how surfactants work. It's pretty cool. You can read the whole article here. Thanks to Samira Kawash at www.candyprofessor.com for sending me the link! What your melting experiment looks like when you use the broiler because your oven's bake function broke. Lots of bloggers write about graphing Skittles or M&M's. This pdf shows the variety of M&M's colors with percentages. I was surprised that brown (at 13%) was almost as common as red (13%) and yellow (14%), since I recently opened a small bag of M&M's that didn't have any browns at all. Thanks to Rachel of Momma Owl's Lab for posting the link to this pdf on her blog, as well as a great M&M's graphing experiment. When I did an experiment party with several elementary school girls last week, I added a Creation Station as one of the experiment stops. Here we put all the candy we couldn't use for the other experiments (sink/float, acid test, and Find Hidden Candy), and encouraged the girls to build with it. They had a blast, creating all sorts of fun art, and it was a great way to use up the candy we couldn't experiment with. 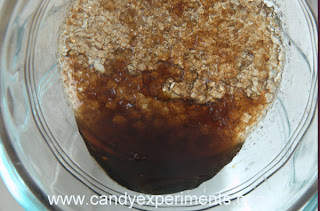 I highly recommend it for any candy experiments party! 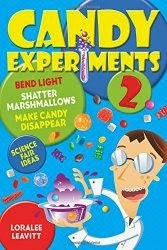 Here's the piece from KOMO TV's show featuring candy experiments. It's amazing how over an hour of filming gets condensed to two minutes! Our only question: why on earth does the reporter introduce candy experiments while standing in Greenlake? Gummi bears have really been in the news lately. Along with teenagers soaking them in alcohol, scientists are sinking them in the ocean to study the crushing effects of the deep sea waves. Read more about it here. I do want to contest one fact in the article, which says "This might be the first time gummy bears have been destroyed in the name of science." We've been destroying gummi bears in the name of science for years now! If you see any "Fluffy Stuff Spider Web Cotton Candy" while scoping the after-Halloween sales, pick up a package. Since the only ingredients are sugar, citric acid, and artificial flavors, they're great for the acid test. Pixy Stix are on sale too, at least in the post-Halloween aisle at my local drugstore. Those are really fun for acid testing. Here's another way to use up Halloween candy. Author Sharon Bowers has come up with lots of great crafts you can design with candy in her book Candy Construction: How to Build Race Cars, Castles, and Other Cool Stuff out of Store-Bought Candy. Like me, Bowers has found that once she gets the kids excited about the candy project and turns them loose, they're not focused on eating it. She tells her kids no eating while building ("What construction worker snacks on the job? "), and lets them choose one piece of candy to set aside and eat after cleanup. Her final rule: "Candy construction workers always brush their teeth after work." In my experience, letting the kids choose even one piece of candy to eat keeps them focused on eating, not testing, so my mantra is, "The candy is for experiments, it's not for eating." But it's nice to know that Bowers has also figured out ways to get children to play with candy instead of eating it. It really is possible to redirect kids' candy mania, and find alternative ways for them to enjoy their candy.